Crank up an onboard fan to get a campfire raging in just minutes. Or, turn it down to keep a mellow fire nearly smoke-free. Igniting a good campfire isn’t always easy. And, it can be hard to find a safe area to light a fire in the first place. 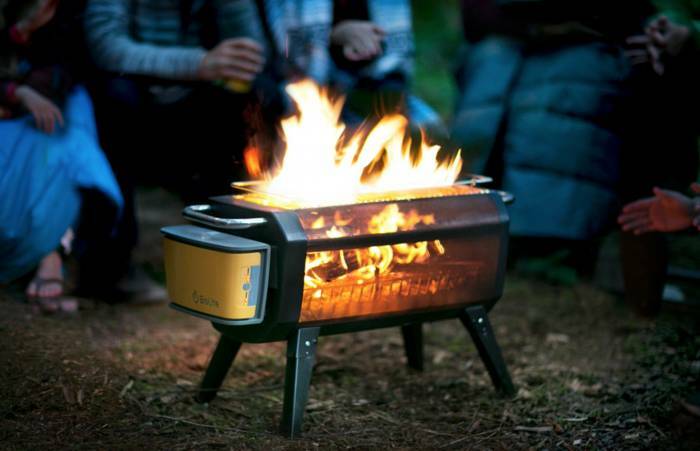 BioLite gives a new option with its FirePit. The 27-inch x 10-inch portable metal unit sits on four sturdy on legs, has perforated mesh metal walls, and handles on either end. A high-temp, glass-filled nylon battery pack and fan unit mount on one side, and the callout feature is a pipe that shoots air into the base of the flames. The system works to build an oxygen-rich fire so hot it produces almost no smoke. The FirePit started on Kickstarter and is now available for purchase on Biolite’s site for $200. It offers an upgrade to a ring of rocks on the ground. In short: In our test, the BioLite FirePit was easy to set up and use. It produced noticeably less smoke than traditional campfires. Included grilling attachments provide space to burn wood or charcoal, and the USB ports offer charging for electronics. Who is the market? 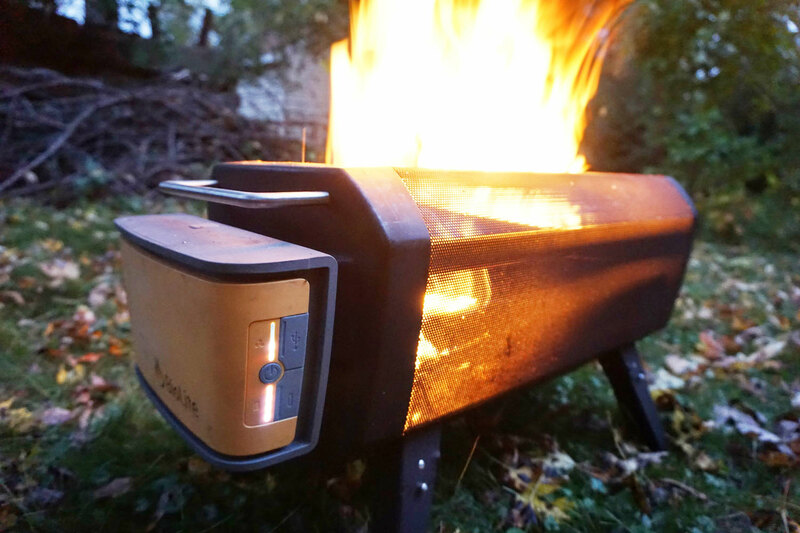 The BioLite was made for hanging out at a beach or backyard bonfires. It’s a neat option for anyone in need of a portable fire pit. The FirePit is portable enough to take in a car, but large enough to hold a few logs of standard firewood. In our tests, it worked best to start the fire just like any campfire, with kindling and combustible materials. But the FirePit excels at expediting a full-fledged fire. The side-mounted fan has four modes. Settings two and three are the “cruising speeds” for normal cook times, according to brand reps. Speed four is for short one- to two-minute bursts that help breathe a fledgling flame to life. And its lowest setting helps mitigate some smoke in long-burning fires. The power button, fan control, and USB charging ports sit along the side of the power station. It has four lights to indicate battery level. The unit was waterproof during our review. It sat through three days of rain during our test then turned back on without issue. For the camp chef, the FirePit’s grill-friendly attachments and flame control make it a solid choice. Its settings keep consistent flame and heat, ideal for preparing meals. Because GearJunkie reviewed a pre-production model, we couldn’t fully test the unit’s battery life. But the brand cites the FirePit will last a full 24 hours on low, 10 hours on medium settings, and five hours on its highest setting. It weighs about 20 pounds, so it’s light enough to carry short distances. When set for transport, the legs fold in. When extended, the legs lift the FirePit about five inches off the ground. The unit has a micro-USB port to recharge. Or, BioLite offers a compatible solar cover for carrying and charging the FirePit. Fifty-one air jets along the top side rails and bottom of the FirePit blow air onto and beneath the fire. In our tests, our flames reached about a foot above the pit with help from the jets. While it kept us warm nearby the fire, beyond two feet on a 45-degree F evening, we couldn’t feel the heat. Overall we’re happy with BioLite’s portable FirePit. We enjoyed its portability the most. It’s the perfect size to move around, yet still hold enough wood and create a good-size fire. We also recommend lifted fire pits like this for their reduced ecological impact. With the BioLite FirePit, you won’t leave scorch marks on the earth, and the full-surround cage keeps most flyaway sparks from flicking into your surroundings. Compared to other smokeless pits like the Solo Stove, which we also tested and liked, the BioLite is much lighter and is designed to pack up and carry. Where it falls short is that the Solo Stove is closer to completely smokeless without using any electricity. 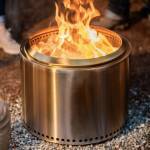 After a successful Kickstarter, the BioLite FirePit is for sale now.